Club President Dave Young, ready to pass the gavel on June 19, is proud of the many accomplishments of the past year. Foremost is the Great Sedona Chili Cook-Off. "All of our giving is based on how much money we can raise for the many programs we help support and having a successful Chili Cook Off is crucial to that end. I feel we had a very successful one this year," Dave said. Other important accomplishments include: helping and supporting the Village Satellite club become its own Rotary club; purchasing equipment for the Bountiful Kitchen (Yavapai Food Council); supporting our students with student exchanges, scholarships and recognition; supporting library and infrastructure projects in Mexico; celebrating our club’s 60th anniversary; and the many other International, youth and community service related programs the club supports. 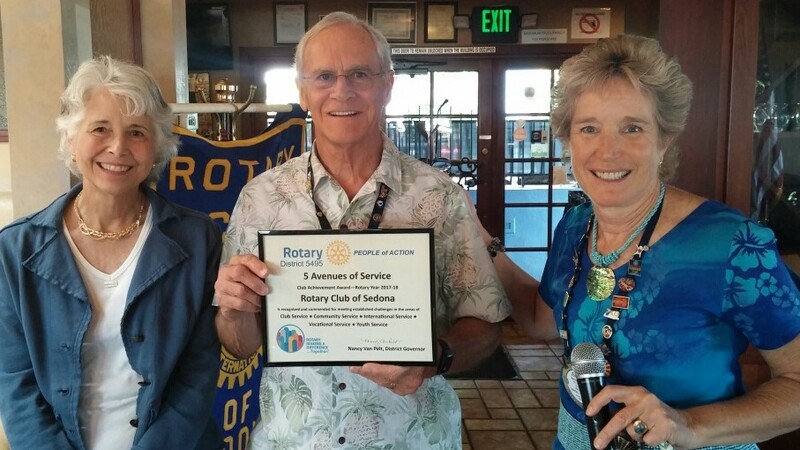 In photo above: Rotarian Jean Barton (left) and Past President Jennette Bill present Dave with the 5 Avenues of Service Club Achievement Award, presented to the club at the District 5495 Conference. 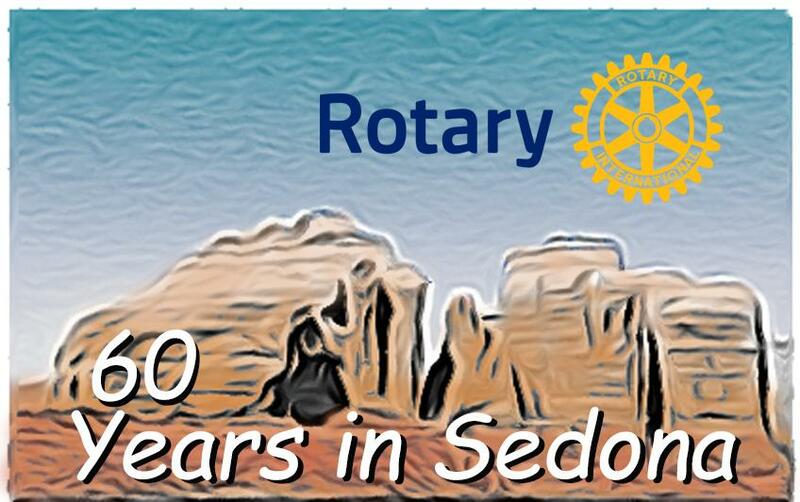 Dave has been a Rotarian for 13 years, 10 of which have been in Sedona. Before that he was a member of the Tempe South Club. He’s also been president twice, secretary for three years, Chili Cook-Off chair for three years and will be club treasurer next year. He’s also the Stewardship Chair for District 5495 for a third year. When asked about next year's outlook, Dave said "We will be a smaller club without the Village Club as part of our membership and smaller than we have been in a number of years. However, I am confident President Elect Holli Ploog can take on the challenges that presents and that membership will step up to help her as I know I will." Club President Dave Young thanks the club for the year's accomplishments resulting in the 5 Avenues of Service Club Achievement Award. The award recognizes and commends the club's fulfillment of challenges in the areas of club service, community service, international service, vocational service, and youth service. Those award activities included: three club officers/members attending Club Leadership Academy; all website and social media reflect official Rotary branding; achieved a net increase in membership; at least one club member served on or led a district committee; partnered with another Rotary Club on a local service project; received a district grant to support a community project; achieved 100 percent annual fund giving; participated in a global grant; assisted with a project that promoted peace; supports the final effort to end polio; attended the 2017 USA-MEX Friendship Conference & Global Grants Exchange; hosted a vocational fair; helps support a project that promotes literacy; provided recognition to students for continued education in pursuit of a career; sponsored at least two students to RYLA; actively supports an Interact or Rotaract Club; supports Rotary Youth Exchange students; and supports a local school by providing recognition for student achievement. "I want to thank the membership for their support and guidance this past year. Without their help we would not be able to accomplish all that we do for the community and the world," Dave said. Club Rotarian and Sedona Fire Marshal Jon Davis said 83% of calls to the Sedona Fire District are for emergency medical services, which also include technical rescues, swift water rescues, and assistance finding lost hikers. The fire district, 168 square miles, serves over 21,000 full-time residents and 3.5 million visitors annually. In 2017, Jon said the district received 4,442 service calls and 2,765 calls for fire inspections. He adds five percent of calls are actual fires with two percent structure fires. He said the fire district assists with wild land fire suppression, provides yard trimmings collection, and community service. 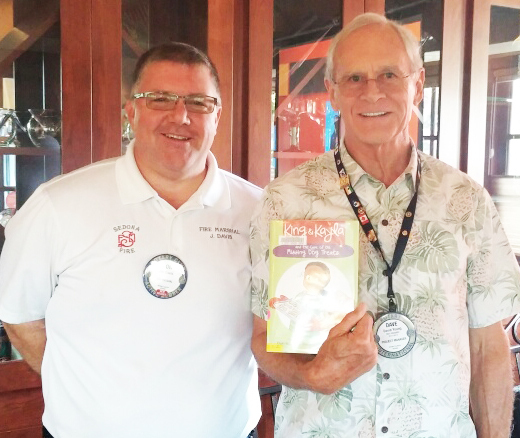 Club President Dave Young announced the book "King and Kayla and the Case of the Missing Dog Treats" will be donated to the Sedona Public Library on Jon's behalf. Keep up the great work Jon! 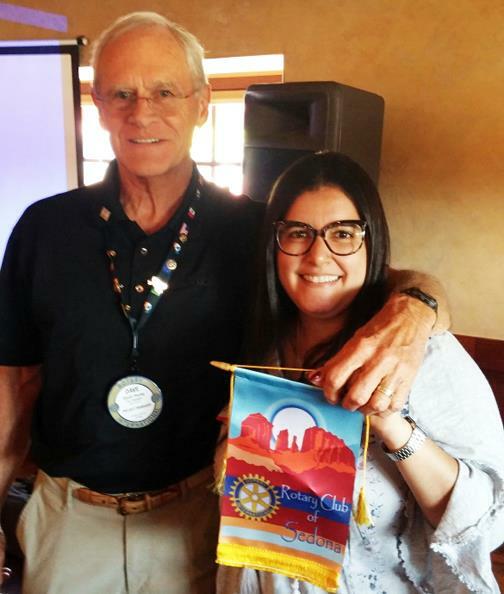 Debbie Barrato, Rotary Young Professional from Brazil, shares her experiences of U.S. and Arizona visit. Her third visit to the Arizona, Debbie says she can see the difference between journalism here and in Brazil. In Brazil she produces a weekly radio program. Here, she's learning all aspects of journalism at ASU's Walter Cronkite School of Journalism. She's also enjoying many Arizona towns and cities. She thanks the club for hosting some of her visit. "Thank you for having me here." Club President Dave Young presents Debbie with a club flag to take home. June 18--Charitable Fund Board meeting, 4:30 p.m. at Sedona Arts Center. June 19--Installation Dinner. Simmer Residence, 6 p.m., 35 Altair Avenue, Sedona, 86336. June 29--Installation Dinner for the Village Club, Oakcreek Country Club. July 3--Club Assembly. Voting on new meeting dates & output of retreat. Bring Habitat for Humanity snack baskets or boxes. July 28-Aug 11--VV Habitat for Humanity Blitz Build project. Club providing hospitality. Need volunteers and snacks.